Topsides separators are designed to handle a relatively constant flow of liquid and gas, but may also have an allowance for slugs. Under certain operating conditions (low flow rate, over-sized flowline ID and unfavorable flowline profile), gas and liquid are not evenly distributed throughout the flowline, but consist of large plugs of liquid followed by large gas pockets. This is called slug flow. Figure 1 shows a regime map that can be helpful for understanding slugging behavior in vertical pipes and risers where slugging is common. Though detailed dynamic modeling should be performed to address slugging issues in risers, the plot is helpful for understanding the phenomena. 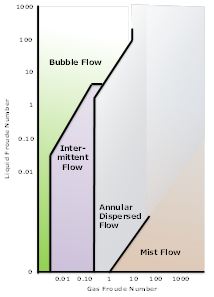 Several flow regimes are identified on the map such as mist flow at very high gas rates and very low liquid rates & bubble flow at very low gas rates. Also note the large zone of intermittent/slug/churn flow in the center of the plot. 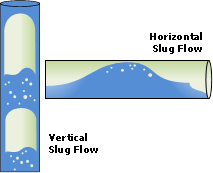 Slugs can also form in horizontal lines such as flowlines and pipelines. Under the influence of gravity, liquids will tend to settle on the bottom of the lines, while the gases occupy the top section due to the difference in the densities. The superficial velocity of gas is much higher than that of the liquid. As a result of this, as the gas moves past the liquid, small pockets of liquid tend to accumulate into slugs. Horizontal slugging is rarely a significant issue. Slugging in risers is a much more significant problem, especially if the terrain supports slug growth. Terrain slugging is caused by the elevation changes in the horizontal pipe, which follows the ground elevation or the sea bed bathymetry. Liquids can accumulate at a low point of the pipeline until sufficient pressure builds up behind it. Once the liquid is pushed out of the low point, it can form a slug. Hydrodynamic slugging is caused by gas flowing at a high rate over a slower flowing liquid phase. The gas will form waves on the liquid surface, which may grow to bridge the whole cross-section of the line. This creates a blockage on the gas flow, which travels as a slug through the line. Riser based slugging (also known as severe slugging) is caused due to the accumulation of liquids at the riser base. The accumulation is more pronounced when the flowline runs downhill (negative slope) to meet the riser base, and when the flowline and riser form a lazy-S at the riser base. Flow of gas into the riser is initially blocked at the riser base by the liquid until sufficient pressure builds up which forces the liquid into the riser at once, causing serve oscillations in the riser. Pigging slugs are caused by pigging operations in the pipeline. The pig is designed to push all or most of the liquid of the pipeline to the outlet. This unintentionally creates a liquid slug. Slugs have three deleterious impacts on topsides. The force of an arriving slug can be very significant. Large and/or frequent slugging can damage piping system and vessel internals. Frequent slugging is stressful for operations. A large liquid slug may result in high level in the inlet separator, potentially resulting in a high level shutdown. For all these reasons, slug prevention/mitigation is important. Proper sizing of the flowline and riser to regulate flow and thereby suppress the formation of slugs. Applying gas lift, either in the well or at the riser base. When sufficient gas is injected, the liquid will be continuously lifted and a steady flow will occur due to increased fluid mixture velocity. The injected gas keeps the liquid moving up the riser. Gas lift reduces hydrostatic head in the riser and reduces the flowline pressure. Effective inlet separator sizing and control. Inlet separators are frequently designed with extra volume as a slug allowance. However, this extra volume is rarely used effectively. The extra volume is wasted unless the control system is designed and tuned to accept and contain the slug. A vessel type slug catcher is essentially a conventional vessel. This type is simple in design and maintenance. A finger type slug catcher consists of several long pieces of pipe ('fingers'), which together form the buffer volume. The advantage of this type of slug catcher is that pipe segments are simpler to design for the high pressures often encountered in flowline systems, than is a large vessel. A parking loop slug catcher combines features of the vessel and finger types. The gas/liquid separation occurs in the vessel, while the liquid is stored in the parking loop shaped fingers. Transient modeling will assist in determining if and when slugging will occur. For example, slugging is usually more likely at high water cuts and low flow rates such as during late in field life and/or during startup. Transient modeling is performed to ensure that the piping conditions are maintained to prevent dangerous surge conditions. It is very important to evaluate the production profile, water break-out, drop in reservoir pressure, operating pressure at the separator, changes in well count etc., over the entire life of the field and for various operating scenarios, including startup, when sizing the production tubing, flowlines and risers. This should be performed during the pre-FEED and FEED stages of the project. Proper sizing of the flowlines and risers coupled with optimal choking and gas-lift will greatly reduce the risk of slugging and help in efficient management of slugs throughout the life of the field.